Pastries distinguish themselves from other foods. More constructed and deliberately assembled to create precise montages of flavors and textures, they seduce us by relying on both formal and emotional qualities. A pastry must appear appetizing, alluring in the shop window, suggesting its various flavors and textures, and later unfold its inner sequence of experiences as one bites into it. Sometimes, the configuration of creams, fruits, and glazings, shinny and dynamic, even suggest a form of holographic baroque movement, as if frozen in time. As a result, time often seems to dilate when eating a pastry, as if we were experiencing it 24 times a second. The mechanics of construction and montage which go into the making of pastries tend to be concealed to the untrained eye, just like in a well edited film or finely detailed building. 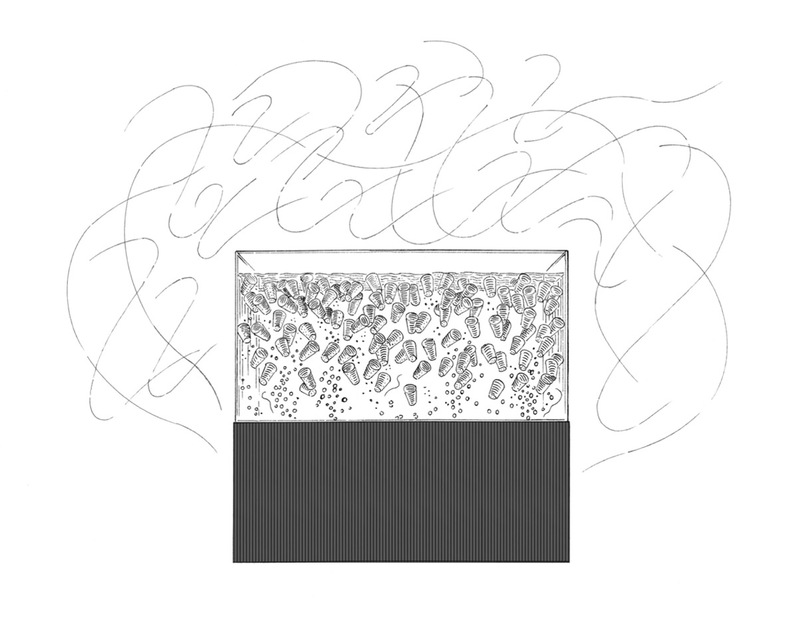 Yet they can become visible and unleash their full performative potential when those characteristics are accentuated, either by drastically increasing the pastry in scale, such as in a centerpiece, or when it is put in a composed sequential context, such as in a platted dessert. Historically, it has been in these moments that pastry, or the culinary, has developed significant connections to other arts. For instance, the manifesto of the celebrated nineteenth century pastry chef Antonin Carême, who was a renowned creator of centerpieces, states that “the most noble of all the arts is architecture, and its greatest manifestation is the art of the pastry chef.” The Futurists on the other hand, used very expressive and narrative plating of unusual combinations of ingredients to create sensorial poetic compositions through food in the avant-garde Futurist Cookbook, published in 1932. Today, as films are becoming less cinematic, and buildings less architectural by losing much of their mysterious and existential qualities by the standardization of a global industry, we are looking for those values in different mediums. In large part, I believe this is driving our current renewed interest in food, and pastry specifically. This piece will illustrate the architectural and cinematic dimensions of pastry through three of my recent (or upcoming) pastry installations – Croquembouches, Babaorium, and La Mort de Camille. Croquembouches, constructed and eaten at Storefront for Art and Architecture in New York on October 25th 2013 and at the Royal Academy of Fine Arts in Stockholm on February 28th 2014, consisted of cones of 1.5 to 2.5 meters of height made of small cream puffs of various flavors welded with caramel onto light mesh structures. As guests navigated between the cones and snapped off the puffs of their choice, slowly creating gaps in the cones until they were entirely consumed, the sounds of crunching caramel in their mouths were very present. 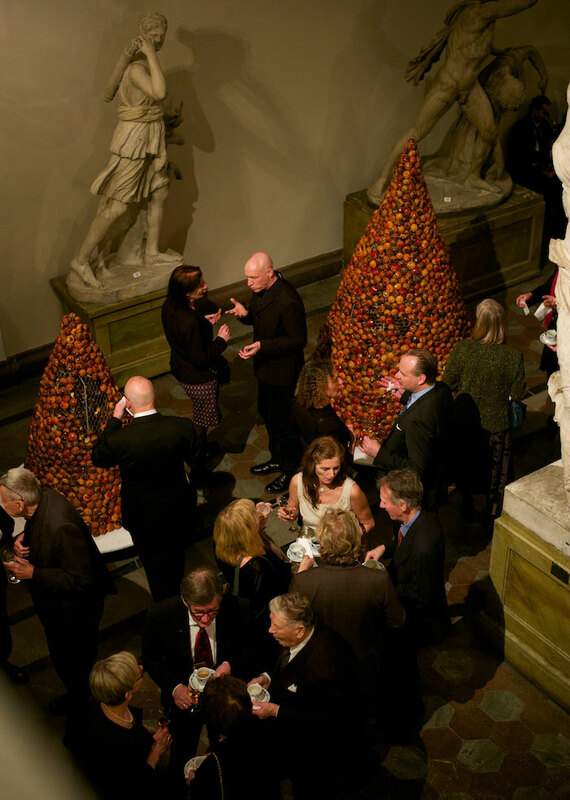 Their large scale gave an architectural dimension to the installation, defining the space around them, making it both a spatial performance and a social event of communal eating. The croquembouche inscribes itself in the tradition of classic French pastry as a decorative centerpiece. Its shiny caramel surface and abstract conic shape, placed at the center of banquets, provided a performative proto-cinematic dimension to the feasts. It is also a modular structure which lends itself to being scaled, and as such can be understood within a contemporary formal framework. It is in fact an avant-garde work of architecture, both structurally and spatially, anticipating parametric design by over a century. With its awkward name and disconcerting appearance, the croquembouche ambiguously combines past with present, spatial with edible, structure with cinematic. The Babaorium, an aquarium version of the Baba au Rhum, is another scaling and mise-en-scène of a classic French pastry. In a dimly lit room, a large aquarium filled with rum soak and floating babas is brought to life by light and bubbles coming from below. After a while, the babas are slowly removed and plated using a strainer ladle and served to the guests with a lump of whipped cream by staff members. Whereas the croquembouche can be understood as being modeled on a classic conception of society and the world, where order and hierarchy are structuring principles, the Babaorium is based on a more contemporary model – fluid and informal. In a time ostensibly dominated by digital innovations, formerly artisanal disciplines like pastry can bring back the sensorial and emotional spectacles once found in circuses and variety shows, and “connect” large groups of people in an analogical way. Reminiscent of traveling “freak shows”, showcasing biological rarities, the babas are staged as mysterious sponge-like creatures, both frightening and captivating. Through the filtered light coming from below projecting onto the walls, undulating and animating the room, the Babaorium takes over the entire space, like an enigmatic magic lantern, and becomes an architectural and cinematic piece. La Mort de Camille is a platted dessert based on one of the final scenes of Jean-Luc Godard’s 1963 film Le Mépris, and is meant to be served at the end of its screening. A blond lemon dacquoise bleeds on the plate, as shattered pieces of almond nougatine are scattered around, capturing the impact of the car accident which kills Camille. Tragedy and glamour are key dramatic elements of cinema which Godard combines in their purest form, and elevates them to mythological proportions. – the iconic hair of Brigitte Bardot, a red Alpha Romeo, Capri, Casa Malaparte, the sea, the gods, the Odyssey. A plated dessert, coming at the end of the meal, should also strive to bring notes of glamor and tragedy to mark the end of a journey. They should not rely on awkward plating trends, commonly featuring meticulous smudges or drawings of sauce and pieces of cake, fruits, and ice cream arranged like large crumbs, to tell a story. 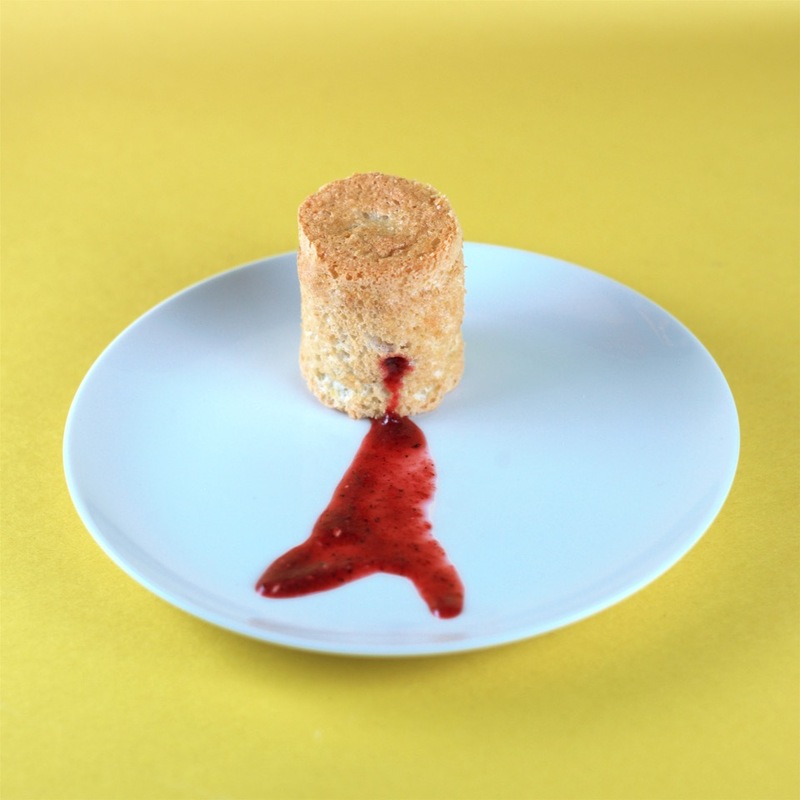 In La Mort de Camille, the blond lemon dacquoise dramatically bleeds its spicy coulis onto the plate. The coulis self-plates when the dacquoise is pierced, left to its own fate. This act, tragic because of its deterministic nature, is in direct opposition to the glamour of the pastry and of the beautiful white porcelain dish.